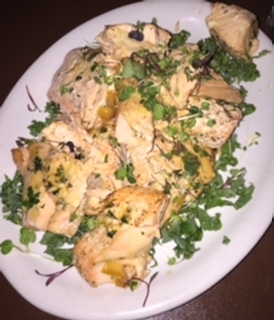 ← Dinner – Twohey’s Tavern – December 11, 2017 – Pasadena, CA. The Federal New Years Eve tasting Menu – Dinner – Tuesday December 12, 2017 – North Hollywood, CA. The Federal bids farewell to 2017 with 3 ways to Celebrate in North Hollywood on December 31, 2017. This is always one of my favorites tasting, brought to me by the fabulous Henry Eshelman, always captivating and a great host. This year was especially great because we were able to taste Georgo’s wine from Sonoma County. The grapes are from Greece but the process is done at Deerfield Winery. We had a nice array of food writers and everyone seemed to bask in lovely holiday conversation. The Federal itself was decked out in the perfect holiday décor. The food was simply marvelous. With 2 different salads offered, Beet and a Cesar it was a nice way to start the evening. The main courses Chicken, Salmon and Prime Rib were the true highlight of the meal. 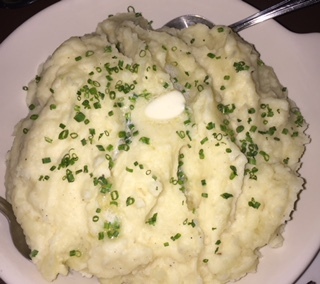 We were served 2 sides as well, vegetables and mashed potatoes. The wine pairings were equally perfect. Santorini, Sophies Smile, 2016, went great with the salads and the salmon. This is a very light and drinkable Sauvignon Blanc type wine, but with nice floral and fruit aromas. 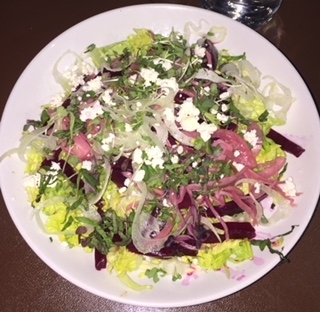 IOS – Aphrodites Kiss, more of a Rose, nice with the salads as well. Ithaka – Penelopes Spell, a well-rounded spicy Cabernet that paired nicely with the Prime Rib as well as the chicken. 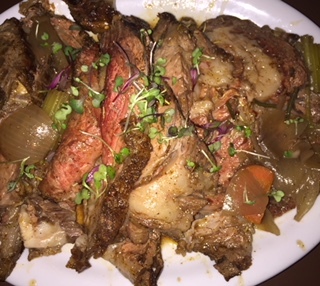 Mykonos -Wine of Hercules was by far my favorite, paired with the prime rib was an other worldly experience for me, and by far my most favorite bite. 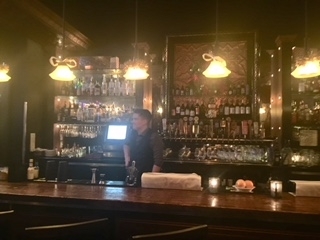 The Federal design features two distinct mixed contemporary and traditional bars on the ground floor – each has its own style and charm with a flair for the 1930’s and prohibition era. Windows opening to the street pushing light off of the resurfaced industrial brick walls, period furniture with a modern style, adding to the premise upstairs, an expansive room with opulent wood floors, treated windows, intimate booths, cushioned leather chairs, private rooms, and a small but decorative stage. Back lounge parlors, open to the public, with a speak-easy theme and a gorgeous outdoor patio, only add to the charm of this 1926 North Hollywood building. Premium sound and flat screens tie in the old with the new and abound through the venue. The Federal in North Hollywood is throwing a New Year’s extravaganza with three distinctive experiences. Each package at The Federal in North Hollywood is unique; so guests can choose how they would best like to ring in the New Year. Dinner and Drinks: is a 4-course prix fixe dinner package featuring Crab Hot Pot, House Smoked Pork Belly, Prime Rib, Herb Roasted Chicken, Wild Salmon, and Chocolate Brioche Bread Pudding. The experience is 75 dollars a person, and includes party favors, admission to the nightclub, and a champagne toast at midnight. Dancing and Drinks: Access to the upstairs night club will feature the SnapBack DJs and dancing in addition to Party Favors and a Champagne toast at midnight. Tickets are available for 25 dollars per person. VIP Open Bar: Their Exclusive Speakeasy, The Salon, is offering a VIP open bar package for 100 dollars per person that includes appetizers, party favors, admission to nightclub, and a champagne toast at midnight. The dining package is based on reservations, but the upstairs nightclub and The Salon will open its doors for New Year’s Eve Guests on December 31, 2017 at 9:00pm. For private events, The Federal Bar is available to rent in whole or in part. This is a no-brainer, great food, fun festivities all under one roof, I would run to buy tickets, and you won’t be disappointed.